This zip file contains files used to create the prototype 8-Bit Ukulele. It is built in a very traditional manner, and if using plywood as I did, many of the pieces are probably unnecessary. The body files are mostly DXF files for the laser cutter. I have also included Corel Draw files that were prepared from the DXF files to print on the Epilog laser cutter at CRASH Space. There are notes in the files for the type of wood to use. The back files are different – they are an Adobe Illustrator and PDF files. This was to make a small modification to the files since I was unable to open the original CAD files (long story). The body itself is 1/8″ (~3mm) birch plywood. The bracing and lining was made from 1/8″ basswood, though balsa or spruce would work. The bridge plate was 1/8″ mahogany, and the head and tail blocks were 1/4″ mahogany. The neck was made of 1/4″ birch plywood pieces laminated together to make up the thickness and design. The fingerboard was 1/8″ rosewood, and the laser files have etch lines for the fret locations. These will need to be deepened with a fret saw. The jig helps with gluing up the sides. The intention was to cut up multiple layers out of 1/4″ plywood and glue them up to make a thicker jig, but I ended up using a single layer. There are circles in the jig design which can be used to make spool clamps, which are very helpful with gluing the soundboard and back to the sides. You can find more information about this spool clamp design on Thingiverse. The string guide is used to determine proper position of the bridge. The bridge saddle was designed using OpenSCAD. 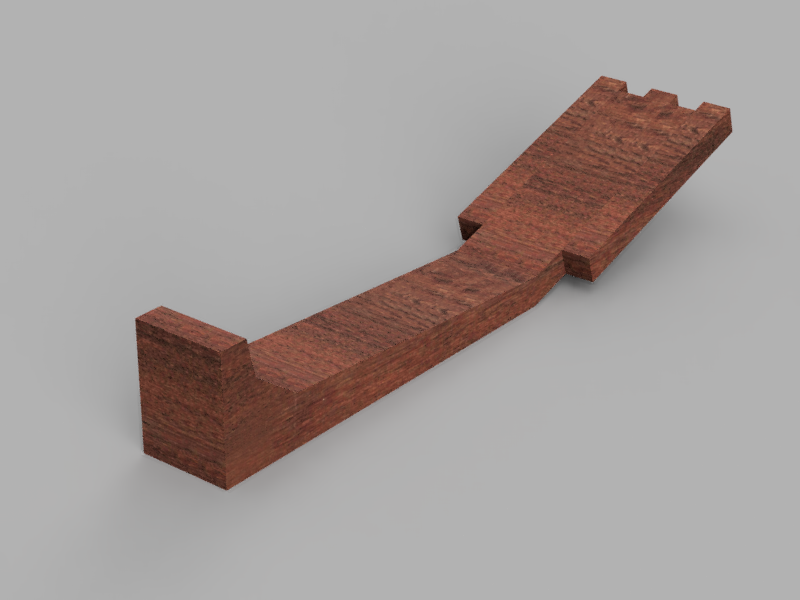 The STL file can be used with a CNC mill from a fine-grained wood at least 3/8″ thick (I used rosewood). It was modeled after the Stuart MacDonald ukulele bridge, so you can just buy one with pre-drilled holes. The nut and bridge nuts were modeled using OpenSCAD. The STL files can be 3D printed. I used white PLA, but traditional bone or synthetic bone nuts can be used. I used the short nut at the top of the neck, and the tall nut for bridge. Both require additional shaping for height and string grooves. The assembly process is non-trivial. General instructions will be added soon. It is possible to omit many of the internal pieces for a simplified assembly if using plywood. Source files are licensed under the Creative Commons Attribution 4.0 International license.